During the winter of 1917-18, soon after painting the Vitebsk landscapes, Chagall created three of his most famous figurative compositions: Over the Town, and The Promenade. They too were painted in Vitebsk, and show that exuberant zest for living which went hand in hand with the new phase of artistic accomplishment he had achieved. To that must be added the political atmosphere - the exhilarating sense of freedom and optimism generated by the October Revolution, which had just taken place. For the Jews the revolution meant true liberation; at last they were entitled to the same full rights as every other citizen of the state. Humiliations such as the young Chagall had experienced during his studies in St. Petersburg, where Jews were allowed to stay only with a special residential permit, were now out of the question. And, as an artist, Chagall belonged to the avant-garde, which had everything to gain from these revolutionary changes. In addition, there was the happiness with Bella to put a golden glow on life despite the many adverse circumstances of the outside world. So these large-scale pictures indicate a high-spirited, even exultant attitude to life, and they all center on Bella, against the background of the home town. In Over the Town the enchanted pair floats gaily over the rooftops of Vitebsk. 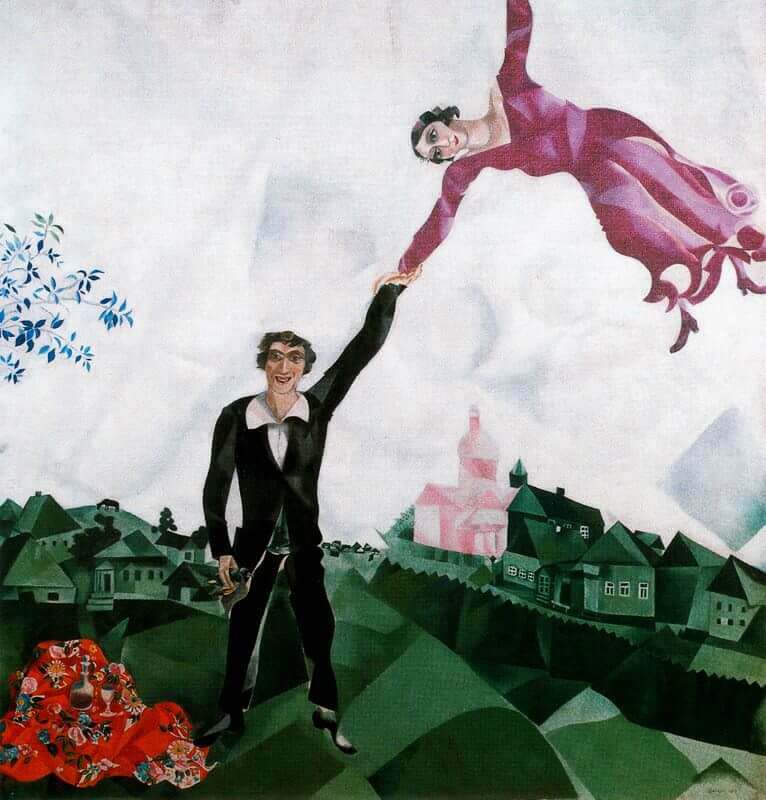 In The Promenade Bella in ecstatic jubilation flutters like a flag in the wind, held up in the sky on the arm of Chagall, who is laughing with joy and is dressed in his best clothes. This ecstasy is in accord with the expansive decorative character of the picture. The dancing double figure extends over the plane like an ornamental emblem. The precious ornamentation of Bella's skirt pleats, as in a Futurist rendering of movement, greatly emphasizes the swinging effect of her floating figure. This ornamental stratification of form goes through the whole picture, arranging the meadow into a geometrical pattern, grouping the medley of cubic houses, reaching up into the sky in a variety of transparent geometrical forms, and culminating in the exuberantly patterned picnic cloth, which appears purely as a surface ornament. All Chagall's experiences gained from Cubism and Futurism-together with those from Henri Matisse - have clearly gone into the making of the picture, but they are used to bring about a closer description of reality, even if the style is a little in the manner of poster art.